Captain Tiffany Danko is currently assigned as the Senior Reserve Officer for US Coast Guard District 8. Recently, she served on the staff at US Central Command as the Coast Guard Senior Reserve Officer. Additionally, she has served as the Commanding Officer of Port Security Unit 312 in San Francisco, California. During that time, she was deployed to Cuba from 2014 to 2015 in Command of PSU 312 as the Maritime Security Detachment Commander for Joint Task Force Guantanamo Bay, Cuba. Captain Danko, originally from Texas, is a 1995 graduate of the U.S. Coast Guard Academy. Her first assignment began as a plankowner on the newly commissioned USCGC Juniper (WLB-201). 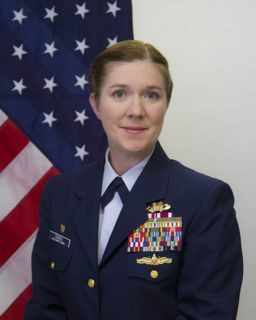 During her career she has served in numerous operational capacities both CONUS and OCONUS including: Surface Warfare Officer aboard USS O'Brien (DD-975), U.S. Navy Seventh Fleet in Yokosuka, Japan; Intelligence Watch Officer and Analyst at the USCG Intelligence Coordination Center in Washington D.C.; Communications Department Head (N-6) at Harbor Defense Command 110 in San Diego, CA; and International Port Security Liaison Officer and Training & Logistics Department Head for USCG Activities Far East in Yokota, Japan from 2004-2006. She served on the staff of U.S. Southern Command in Miami, FL, serving as a Security Assistance Officer for the Caribbean in the J-7 Theater Engagement Directorate. In 2011, she assumed duties as the Senior Reserve Officer for USCG Sector Jacksonville, FL. She has participated in numerous OCONUS deployments in support of Operation Enduring Freedom and Operation Iraqi Freedom operations as well as Operation Unified Assistance, Operation Unified Response, and operations throughout Asia and the Persian Gulf. Captain Danko is also a Lecturer for the Northeastern University Masters of Homeland Security and Intelligence programs. Captain Danko is a 2013 U.S. Naval War College Command and Staff Program graduate, and a 2015 graduate of Joint Forces Staff College Joint Combined Warfighting School (JPME 2). Currently a doctoral candidate at Northeastern University, she earned a Master of Arts Degree in Human Performance Technology from San Diego State University in 2004. She is also a Navy Surface Warfare officer (SWO) and Department of the Navy International Affairs Level 1 Professional. Her awards include the Defense Meritorious Service Medal, Meritorious Service Medal (two awards), Joint Service Commendation Medal, Coast Guard Commendation Medal, Coast Guard Achievement Medal (three awards), Navy Achievement Medal (two awards), and numerous service and unit awards.